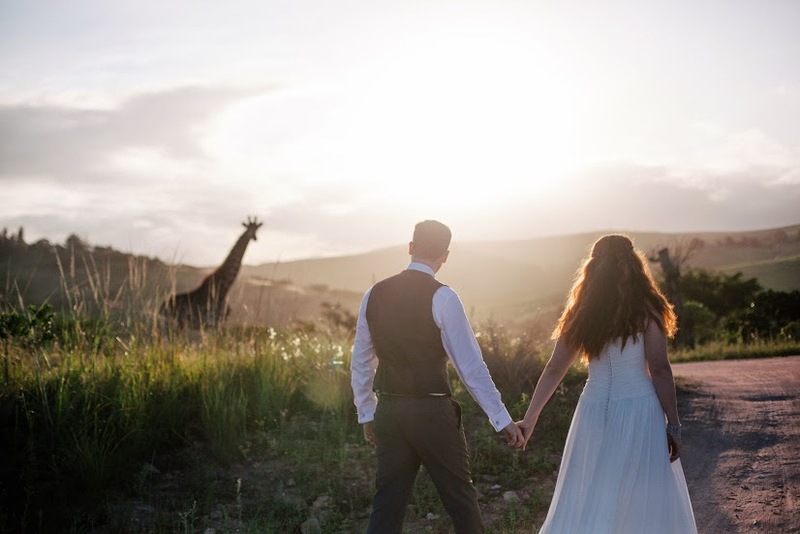 Dear South Africa – your weddings are amaze balls. That is all. If you’d have asked me if I would ever have considered an overseas wedding I would have said “hell no”! My family and friends, not there? How could I fathom that concept and even consider getting married without my nearest and dearest there to witness the magic!? But after time and a certain fiancé nurturing the metaphorical seed I actually came around to the idea and thought, well you know what – “why not”?! I suppose it’s at this point I should mention that, yes, this is my realwedding that I’m talking about and being a wedding coordinator I came around to the idea that I might like something totally out of my comfort zone for my Big Day. It was for this reason we started looking at South Africa as an option for our wedding – my fiancé being South African and the fact we got engaged there 2 years prior, it just felt right that this would be the place where we would go to cement our relationship. I should also mention at this point that unless you have an extremely organised mother-in-law-to-be in your country of choice, then get yourself a wedding planner without a second thought! It’s fair to say that Angus and I had the lion’s share of disagreements with regards to the wedding and my ‘vision’ did not always prove favourable. Ultimately my now hubs was going to let me choose what I wanted and what I dreamed of, which he did and I can’t thank him enough for. I look back and think ‘My God! He really let me decorate everything with leopard and giraffe print? 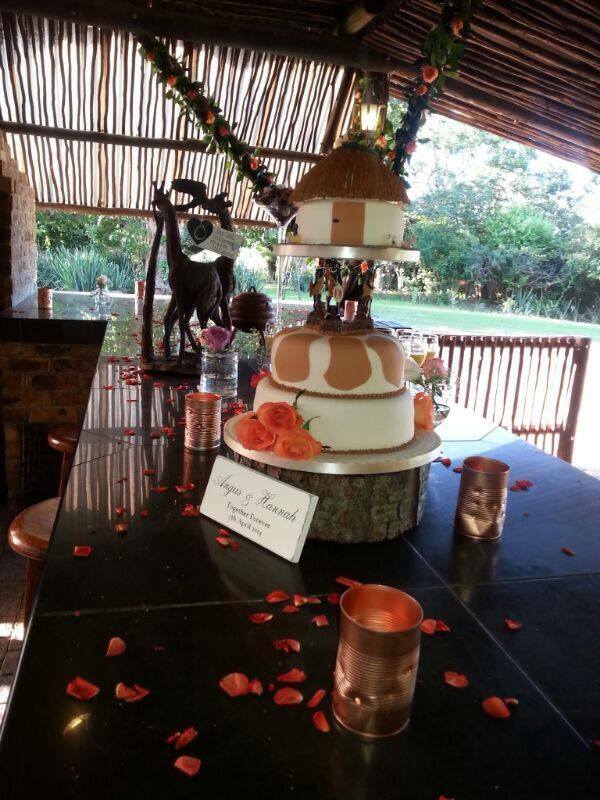 He’s a keeper!’ Our cake did not meet with tradition either and our 3 tiered giraffe print cake, sitting on a homemade round of tree trunk with a traditional African hut sitting at the top held up by Zulu warriors fit the theme perfectly! Angus admits that he loved our cake which we designed together only a few days prior to our big day! The thing with a wedding abroad is the feeling of a lack of any control. Everything and everyone who is part of your day is so far away and it feels like you are almost alienated from what is going to happen. Whilst this may feel like the case, it’s actually not. You’ll have no more control here than you do abroad, you’re just closer to what could be uncontrollable chaos! Tip: keep an organised folder of all suppliers, venues & costs just as you would for a ‘home turf’ reception. Schedule Skype meetings with suppliers rather than communicating via email – this was our biggest issue and Angus took the reigns on a number of occasions to fix problems we were having with certain suppliers when it all became too much for me. I mean, 10 days before your wedding and you don’t have any tables or chairs for people? Get a grip! No, get a wedding planner! 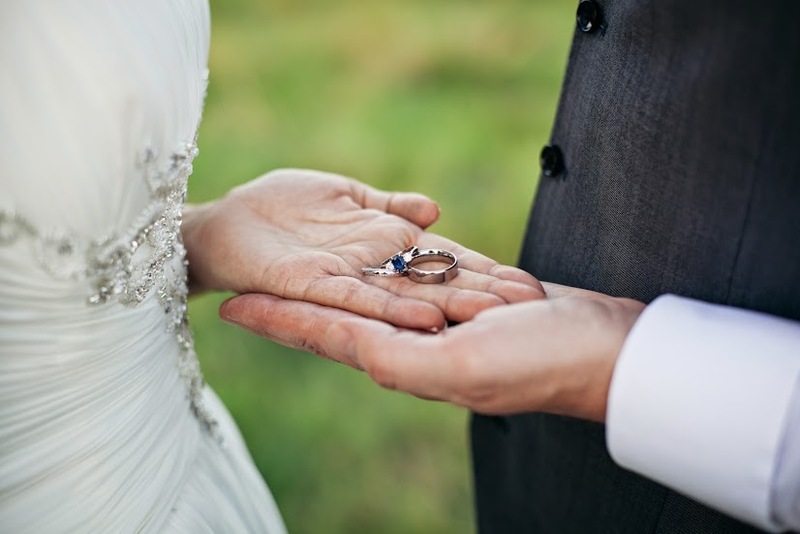 Set your wedding budget and allocate a percentage of that budget to a planner to help keep your ideas on track and suppliers in check. It’s probably poignant at this stage to say, don’t expect all of your friends and family to come. Costs, fear, unwillingness – whatever the reason, the people who you are sure that will be in attendance could possibly find a reason not to be there. Our guest list was around 35 when we started out that included our family and friends from around the globe (including mandatory child invitees) and we ended up celebrating with just 12 of our loved ones. For me, I couldn’t have asked for anything more perfect. We sat around one table, outside under a thatched roof, looking out over a lake in our own spectacular piece of Africa. The staff and wedding coordinator Sunette at Rain Farm Game and Lodge were superb and could not have done enough for us. They stayed late the day before when we arrived, helped us setup and were so helpful and friendly, we couldn’t have asked for more! The big day was nearly upon us, our giraffe print invitations had gone out and most people had replied formally, sort of! I had of course bought my dress a few months after being engaged in Ashtead, Surrey from Brides Visited and my shoes I bought from Irregular Choice. We got Angus’ suit from Moss Bros and the bridesmaids dresses were ordered from the states as David’s Bridal were having a sale! Thrifty cow I am! Our best man was actually Angus’ son Ciaran (and his daughter my maid of honour) so we got him a little matching suit from Next. If anyone is looking for a little person’s suit, they have some great options! I’m not going to go into too much detail about my Asda jewellery (really not a massive jewellery girl) as not to make anyone laugh too hard, needless to say, I did not break the budget on my choice bangle and pearl earrings! On the day itself after much hair pulling and heart palpitations (having only viewed our chosen venues in reality 4 days prior to our wedding) you’ll be pleased to know that…everything sort of went wrong! The flowers were the wrong colour, the nails I had wanted couldn’t be done, the driver (from Manchester would you believe) got lost…it was all a bit of scramble – however, having spent that morning with my best friend and daughter-in-law in the hot tub eating cereal, I was so relaxed I couldn’t have cared less! It’s funny how you spend so long planning for your fairytale, whatever your fairytale is and just how little it matters when things go awry. All that was in my head was, Angus. I wanted to see him, to marry him and to share our little piece of paradise with the people we loved. 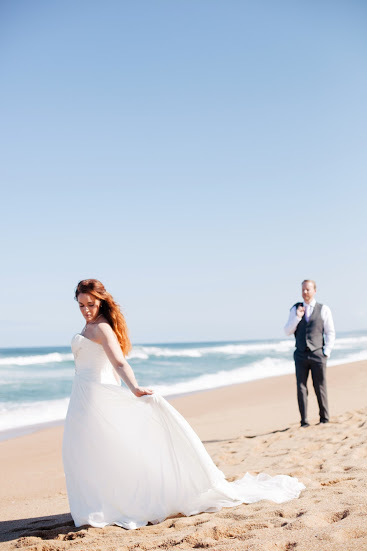 We were married on the beach at Zimbali resort on Monday 7th April 2014 followed by canapés and drinks back in the stunning resort itself and had our reception in the wonderfully rustic Rain Farm Game and Lodge in the aptly named Giraffe House. We saw zebra, giraffes, wildebeest and caracals, had a surprise group of traditional Zulu dancers sing and dance with us at the end of our meal and spent the most magical day of our lives with our family and friends and the best part is, we had Graz from Durban Wedding Productions to capture the whole thing! The next morning, Angus and I set off early from what has to be the largest bridal suite in existence and headed to Hluhluwe Umfolozi about 2 hours North of our reception venue where we got engaged. We had our ‘Mini Moon’ in one of the most special places in my world and spent the next 3 days watching elephants, lions, hyenas, giraffes, rhinos, impala, kudu….I’ll stop now. I could go on for hours about the details and the planning but instead I’m going to let our photos by the fabulous Bron Fourie from Vanilla Photography do the talking. Our Real Wedding! ← Ain’t No Sunshine: Wedding Prep for all Conditions!